84111 • Tamiya Tyrrell P34 Six Wheeler 1976 Japan GP • F103 • (Radio Controlled Model Archive) • RCScrapyard. RCScrapyard ► Iconic Vintage Radio Controlled (RC) Model Car Archive ► Tamiya Tyrrell P34 Six Wheeler 1976 Japan GP. (F103) #84111. 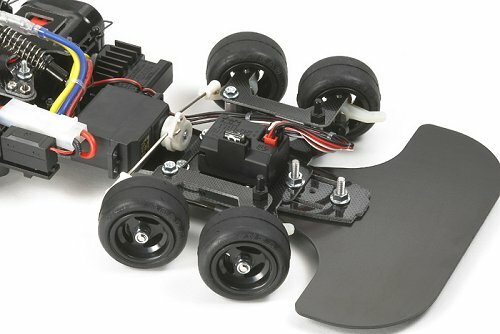 Released by Tamiya on January 9, 2010, this model of the original 1975 Tyrrell P34, that was the first and only 6 wheel Formula one car, has been reproduced by Tamiya a number of times. This version is No.611 in the Limited Sale Series, based on the F103 chassis. In the old F102 the steering servo was laid on its side, this meant the track rods were different lengths, giving the car a different turning circle on the left to that right. In the F103 the servo is held upright in a fixed frame, allowing the rods to be of even length. My first thoughts when I saw this was it raised the centre of gravity. However, my first run of the F103 was a revelation. The car handled like a dream, I was amazed at the difference a small change like that could make.